Merchant shipbuilding in Britain is going through a period of radical change and innovation aimed at overcoming the effects of falling de- mand for tonnage worldwide. Cur- rent strategy is concentrated on re- ducing head-on competition with the "price-leaders" of the Far East, and capitalizing on computer tech- nology to refine specialized designs and products. Photo-Atlantic Conveyor, a sophis- ticated Ro/Ro container vessel built for Cunard by Swan Hunter Ship- builder. which, although nationalized, is un- der the direct control of the North- ern Ireland Office. 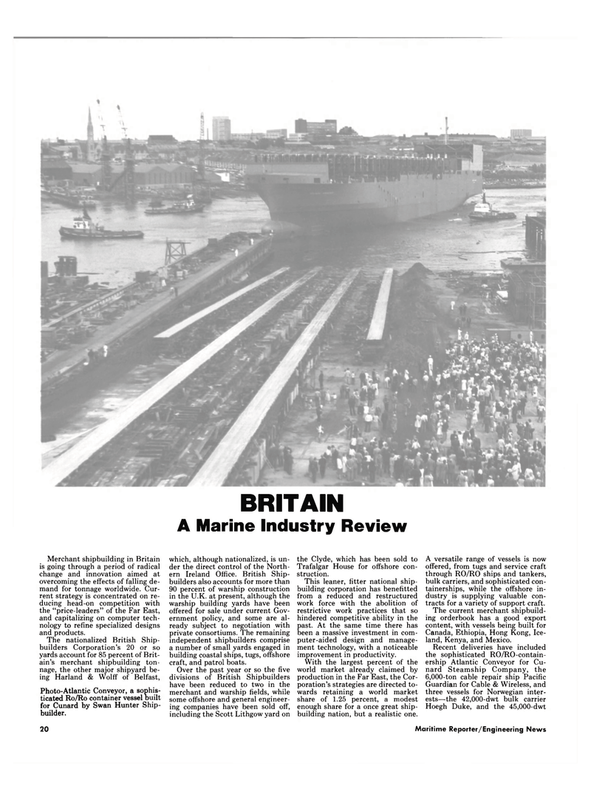 British Ship- builders also accounts for more than 90 percent of warship construction in the U.K. at present, although the warship building yards have been offered for sale under current Gov- ernment policy, and some are al- ready subject to negotiation with private consortiums. The remaining independent shipbuilders comprise a number of small yards engaged in building coastal ships, tugs, offshore craft, and patrol boats. Trafalgar House for offshore con- struction. This leaner, fitter national ship- building corporation has benefitted from a reduced and restructured work force with the abolition of restrictive work practices that so hindered competitive ability in the past. At the same time there has been a massive investment in com- puter-aided design and manage- ment technology, with a noticeable improvement in productivity. With the largest percent of the world market already claimed by production in the Far East, the Cor- poration's strategies are directed to- wards retaining a world market share of 1.25 percent, a modest enough share for a once great ship- building nation, but a realistic one. A versatile range of vessels is now offered, from tugs and service craft through RO/RO ships and tankers, bulk carriers, and sophisticated con- tainerships, while the offshore in- dustry is supplying valuable con- tracts for a variety of support craft. Canada, Ethiopia, Hong Kong, Ice- land, Kenya, and Mexico.